Gift and Promise shows that the theology of the Augsburg Confession is as much a gift to the world today as it was when first presented in 1530. Building on a book started by Ed Schroeder (three chapters are presented in the first part), nine of his students present the theology of the Augsburg Confession in language that makes it accessible to those without a scholarly background, including pastors, students, and lay people interested in Lutheran history and theology. 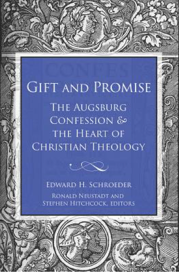 Gift and Promise establishes the theological “hub” of the Augsburg Confession- what the Confession itself calls the central teaching of the Christian faith -in the doctrine of justification by faith alone. That hub is traced to its source in Luther’s theology of the cross. Each chapter presents how that central hub is articulated in the articles of faith that comprise the Ausgburg Confession. Lucid, powerful, and insightful, the expositions in this volume are written by expert theologians, historians, and scholars who aim to present the crucial and practical message of the Christian life in the Augsburg Confession for all.